Manila paper is a relatively inexpensive type of paper, generally made through a less refined process than other types of paper. It is typically made from semi-bleached wood fibres. It is not as strong as kraft paper but has better printing qualities. Manila is buff-coloured and the fibres are usually visible to the naked eye. Manila is most commonly used for making file folders and envelopes, called manila folders and manila envelopes respectively. Some fashion schools and people in the fashion industry use large rolls of Manila to create finalised clothing patterns. Because this paper is generally inexpensive, it is commonly given to children for making art. Manila paper was originally made out of old Manila hemp ropes which were extensively used on ships, having replaced true hemp. It was made from Manila hemp (also called abacá) or Musa textilis which is grown in The Philippines and hence the association with Manila, the capital of that country. Abaca is an exceptionally strong fibre, nowadays used for special papers like teabag tissue. It is also very expensive, priced several times higher than woodpulp, hence the change to that fiber for what is still called Manilla—usually with two "ll"s. More recently new woodpulp has often been replaced with a high proportion of recycled fibre. 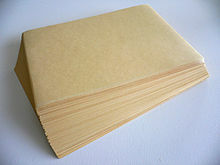 True manila hemp folders would have been much tougher and long lasting than modern folders. ^ Knox, Frank M. (January 1965). The Knox standard guide to design and control of business forms. McGraw-Hill. This page was last edited on 11 December 2018, at 11:23 (UTC).